Tonight I made two Baptism cards using the sketch from the Challenge over at Freshly Made Sketches. 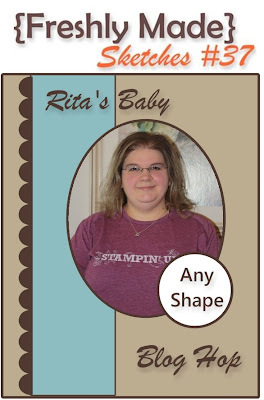 The are having a Blog Hop for one of their DT's who is having a baby soon - Congrats Rita!! The paper is from the Meadow Lark Collection 6x6 Paper Stack from Prima. I used a Fiskars Paper Punch on both cards. All of the embellishments are from Close to My Heart. Pretty cards! Both have such a romantic, soft feel. So nice! Such beautiful and soft cards. I love the crochet flowers and that gorgeous paper! Wow ... what beautiful cards, soft and serene ... the colours are lovely, love the crochet flowers and organza ribbon accents! Both cards are so beautiful, and I really like the ribbon treatment on the one on the left. Thanks for sharing with us at Freshly Made Sketches this week!